“Get off my lawn, ya damn kid,” the old dragon slayer said. Marche stopped climbing up the hill and looked around. Nothing but prairie grass surrounded him. As far as he could tell, all the land within miles was the old man’s lawn. “Are you Hed Pelenore? The dragon slayer?” Marche asked him. The old man yanked out a weed from the flowerpots on his porch and added it to his bulging handful. He looked terribly aged, but he could still bend up and down without groaning. “Eh? There’s no dragon slayer here. Not no more.” He scooted back into the house. Marche banged on the door. “Please, I need your help with-” The rotted wood splintered at the hinges and the door fell in. Marche panned around the room. The walls were covered in trophies, plaques, and mounted objects, all taken from dragons. Two dragon claws served as bookends on a shelf. A glass frame with a set of long serrated teeth, pinned on velvet, hung next to it. Marche looked above the entrance and yelped. A blue wyvern head stared down at him–yellow slit eyes gleaming, jaws open for the kill. Pelenore grunted and turned away. “I’m done with that now. If you came here looking for someone to slay your dragon, look elsewhere.” He went back to the kitchen and dropped the dishes in the tin washtub. “Aye. Not too many dragons anymore, so no dragon slayers. Can’t say I know of any myself that are still around. I used to chum with Jasper Cottingwood, down at the tavern, but he’s not coming in as often anymore. Good guy. He loved jousting. We could talk about the matches forever.” He laughed to himself as he washed a plate. Marche pulled out a broadsword from the sheath on his belt. It gleamed in the window-scattered sunlight. “I inherited it from my grandfather. Tempered steel,” Marche said. Pelenore stepped on a stool and pried the spear off–age had stuck it to its moorings. “I imagine they would,” Marche said. Pelenore dragged the lone colt out of the stable. It tossed its reins back and forth. “I know. I’m not happy about it either,” Pelenore said to him. Pelenore pulled out a step stool from the stable, and placed it under the horse. With a held breath, he raised his leg over and fell in the saddle. “Ooh, I don’t think I’ll do that again,” he said. Pelenore directed his horse to Marche’s side. “Do you need anything more? Any armor?” Marche asked. “Uh-huh,” Marche said, who urged his horse faster, hoping the old man would follow. “A will?” Marche’s eyebrows shot up. He pointed to a small ravine with a wooden bridge lying across. Three trolls stood in front, wearing tattered leather jerkins and brandishing daggers. “A troll bridge,” Marche said. The smaller troll in front, not more than two feet high, wiped his bulbous nose. “Aye, ye did,” he said. “But ‘e ‘asn’t.” He pointed the twisted blade at Pelenore. Before Marche had gripped the hilt, the lead troll pounced on him. Marche stumbled backward as the troll climbed up to his face and bit his nose. Marche yelped and fell on his back as the other two trolls piled on. One plucked the money satchel from his belt like ripe fruit. Marche pulled the troll off his face and threw him aside as the other two ran away. The third followed them into the ravine where they disappeared. “And what would you have done?” Marche said. Marche hoisted himself on his horse. He glared at Pelenore, who only grinned. “Well, what are you waiting for, kid? I thought you said we had to make haste. Yah!” He whipped the reins and the horse took off at a gallop. Marche and his palomino followed. At sunset, they reached the foot of Mount Brigadier. “Who is she?” Pelenore asked. “The girl? What? What girl?” Marche stuttered. “Everyone’s used to the hurt by now,” Pelenore nodded. “Yeah, but you got to do what you got to do,” Pelenore smirked. Marche rolled his eyes and played with a twig. Marche jammed himself into his bedroll and turned away. Pelenore stared into the fire. He rubbed his back, which was sore from riding. Marche grumbled and turned over, but said nothing. Pelenore crawled into his bedroll and went to sleep. The sound of ringing bells woke Marche. It was still night, and the fire hadn’t quite died. “Dammit,” a hushed, gravelly voice said. “Wot was that?” another said. From his bedroll, Marche saw three trolls hovering around their two sleeping steeds. Their stubby hands curled in the air around the saddle’s straps. Marche looked to Pelenore, whose eyes had just opened too. Marche mouthed the word ‘trolls’. Pelenore glanced at them. Marche’s eyes fell on the sheathed sword next to his bedroll. He glanced back at Pelenore who nodded and looked around for a weapon of his own. A big rock sat behind his head. As Pelenore grabbed the rock, Marche quietly slipped out of his bedroll. The trolls still bickered among themselves. Marche snuck towards them, his hand gingerly wrapping around his sword’s hilt. His foot landed on a twig, which snapped. The trolls looked back, startled. Pelenore launched his rock with a heavy grunt. It arched low and struck the smallest one on the ankle. Marche unsheathed his sword and raised it above his head, screaming a war cry. But the trolls were already running, and he sliced downward into empty ground. Marche ran a few steps, then stopped, knowing he’d never catch them in the dark of the forest. Marche laughed out loud. The tension from the encounter rolled off him. Marche pursed his lips and looked back at where the trolls had escaped. He returned to his bedroll, snuggled in, and went back to fitful sleep. The next morning, Pelenore woke to broad daylight. When did he fall asleep? He knew he had managed to stay up at least a few hours, keeping watch. His back hurt from the ground and he needed to make water so bad his pelvis ached. Marche was gone. So were all his supplies and both horses. The fire was doused and scrubbed. He was all alone in the forest. “We’ve all been there. Comes with youth,” Pelenore said. “Not many young people do.” Pelenore smiled and rolled up his sleeping bag. “Nothing,” Marche said, staring into the cave’s mouth. “Maybe throw a rock in,” Pelenore said. Marche picked up a fist-sized rock and chucked it into the darkness. There was a sound of clacking stone a few yards away, but nothing else. The horses behind them chuffed at the noise. Marche held the pike out in front of him, and the two treaded into the cave. They both lit their lanterns as the darkness swallowed them. They came to a branching path, with both ends lapsing into pitch-black. Marche held up his lantern, but couldn’t discern a difference. Pelenore’s eyes didn’t work well in this weak light, so he listened to each portal. Nothing. Either his hearing was failing, or there was no sound. Pelenore glanced back and forth between the two branches. Then he turned around to see how the dragon would view the cave’s entrance. A collection of stalactites almost blocked the left branch. “Oh, this one.” Pelenore pointed to the right. The two walked down the right tunnel. The walls had been worn away to jagged smoothness, which further convinced Pelenore that they had chosen correctly. Then they heard the breathing. “Now that is definitely a dragon,” Pelenore said. Marche nodded. “I believe you.” The thick, leaden breathing sounded like a fireplace bellow. Marche took the sword out of its scabbard and nodded ready. They both poked their heads into the cavern. There was a collection of animal bones in one corner, deep claw gouges on the wall above. A burbling lava pit in the center cast the scarlet glow saturating the walls. “I don’t see him,” Marche said, entering fully. As if in answer, the ground vibrated. Marche held up his sword, but Pelenore stood his ground. At the other end of the grotto, rock dust and pebbles burst from a crack in the wall. An azure, pointed snout emerged, followed by the head, neck, and body of the dragon. “Is that… it?” Marche asked. It stood ten feet tall, but looked as decrepit as a dead tree. Its claws were cracked and yellow. Its rough and dull scales flaked away as it walked. Its skin sagged to the floor, like a loose suit. And it stared blankly ahead with milky-white pupils. Whether it heard the two, or simply needed to vocalize, it roared. But the sound came out as a tired burble. Its maw revealed only three remaining gray teeth. After, it shuddered, shaking the perforated membranes of its wings. “I’ve been killing dragons all my life, but this isn’t how we did it back then. And it’s not how I’m going to do it now.” Pelenore dropped his spear. The dragon looked toward the noise, snorted, then laid down. “If you’re not going to kill it, I will.” Marche started for the spear. Pelenore sighed like an old man, trying to think. Marche strode into the town square. Street by street, the collective population of Tabar gathered behind him, drawn in by his squared shoulders, his confident demeanor, and the large spear hoisted on his shoulder. With the entire town now collected, Marche stood on the platform in the middle of the square. He saw Giselle in the back, surrounded by maidens and mayoral retainers. “Townspeople,” Marche announced. “There is no need to pay tribute to the dragon any longer. No more sacrifices. I have slayed the beast.” He raised his spear in the air triumphantly. “Just you?” an old crone uttered. Others laughed. “Let’s see it,” the townspeople said. Hand shaking, Marche reached into the sack. The crowd grew silent with anticipation as he pawed through its contents. He seemed to be taking an abnormally long time to produce his prize. Marche retracted his arm. His hand held the gaping head of a dragon. Its yellow eyes gleamed with primal rage. Its jaw hung open, filled with needle-sharp teeth, ready to snap off a limb in one bite. The crowd gasped. The crowd, unable to turn away from the grisly sight, said nothing for a moment. Then a farmer pumped his fist in the air. “Huzzah for Marche, the dragon slayer!” The crowd erupted in a chorus of cheers. The townsfolk whooped and hollered in celebration, throwing hats in the air and exchanging embraces. In the chaos, Giselle ran up to the podium, tears in her eyes. She wrapped her arms around Marche and kissed him. Marche nearly dropped the head, but had the presence of mind to subtly place it back in the sack, as he dreamed of their new life together. Pelenore whistled as he opened the stable doors. His joints felt good this morning. Either the humidity or udder balm was working for him. A pleasant grunt sounded from inside the stable. A giant dragon’s head emerged, droopy whiskers brushing across the grass. It looked up toward the sun and cooed. Pelenore had never heard a dragon coo before, and laughed as he poured a bucket of virgin pig’s blood into a wide trough. The dragon bowed its head in and began lapping it up. 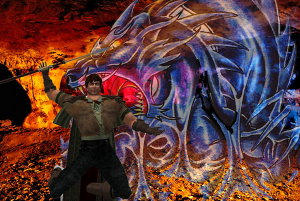 Pelenore patted the dragon’s head and watched him noisily slurp every last drop. When the beast was done, it trudged out, the loose chain around its neck clinking. Of course, Pelenore had taken the precaution of restraining the beast, but it rarely ever struggled against the shackle. The dragon curled up on the grass and went to sleep, its belly exposed to the sky. Pelenore went back to his cottage. He got a cup of tea from the kitchen and sat down in front of the fire. As he reached for the book on the side table, he glanced up at the plaque over his doorway. The faded globular outline, indicating something absent, looked unsightly. But it was still the best trophy he had.